Periodontal (Gum) Disease is a “silent” disease – until their teeth become loose and fall out, most people do not know they even have it, or how serious it is. It is the #1 reason adults lose their teeth. In fact, did you know that more than 75% of all adults have gum disease? Recent Dental/Medical research has shown a direct correlation to periodontal disease and systemic health. People with periodontal disease have an increased risk of stroke, heart attack, diabetic complications, and serious problems with pregnancy. If you wear a partial denture, does it still fit the same? If any of these statements are true, then you may have a problem with your gums. You may need more than just a routine cleaning of your teeth to get your gums healthy again. A thorough evaluation of your gums and your overall dental health includes a comprehensive examination, a complete set of x-rays, and periodontal probing. 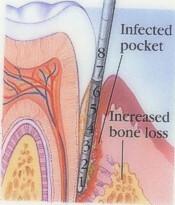 If there is bone loss and deep pocketing you may need non-surgical periodontal or surgical periodontal care. The adjacent photo depicts healthy teeth, gums and bone. In healthy gums a periodontal probe instrument should only go 1-3 mm (marks) into the gum. Regular checkups with professional cleanings will help keep gum tissue in good health. 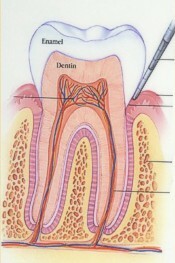 Gingivitis is the early stage of periodontal disease. The gum tissues are red and puffy, and there is plaque and tartar building up around the teeth. There is no bone loss, yet. 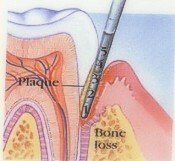 The probe measures 3-5 mm into the space between the teeth and gum. During this stage, gingivitis can be reversed with proper treatment. This is the most serious stage of gum disease, since the infection has destroyed most of the bone around the tooth. 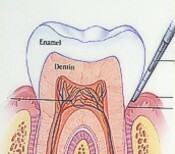 The plaque and tartar covers the tooth well below the gum and on the roots. The gums recede even further; the teeth become loose and can shift causing your bite to change. If the pocket between the tooth and the gum is more than 8 mm. you are at great risk of losing your teeth. With Periodontitis, the plaque and calculus spreads down the root infecting the bone and the ligament holding the tooth into the jaw. This causes the gums and bone to recede away from the tooth. The space between the tooth and the gum measures more than 5 mm and traps food and more plaque under the gum. With proper treatment you can prevent further damage. Maintaining good oral health is the key to keeping your teeth for a lifetime. This includes regular visits to the dental office for cleanings, x-rays and check ups. Cleanings can be as infrequent as every six months, or as often as every three or four months, depending upon the health of your gums, and how quickly you develop tartar and stains on your teeth. Remember that 75% of all adults have periodontal disease. Home brushing and flossing are the building blocks to a lifetime of healthy teeth and gums. Flossing removes food that might remain between your teeth after you brush. If the food is not removed, it can start decay, and if the food gets trapped in your gum, it can cause gingivitis, or make your existing gum disease worse. You should brush 2-3 times a day, preferably after every meal and before you go to sleep. Non-surgical periodontal treatment is possible for the early and moderate stages of periodontal disease. This treatment involves removing the plaque and calculus (tartar) that has formed under the gum – in the area known as the pocket, and smoothing the root surfaces. With moderate to advanced Periodontitis, bone loss is present and surgical periodontal treatment may be required. All patients that undergo periodontal treatment, whether it is non-surgical or surgical, need to have their teeth cleaned and their gums checked on a regular basis. This will be as often as every three to four months. It is vitally important to do this to prevent further periodontal problems. Periodontal disease is a chronic problem. Without ongoing treatment, the infection and disease will recur, and each time it does, more bone can be lost, until eventually the teeth become loose and need to be removed. The goal of non-surgical periodontal treatment is to bring the gums back to good health by shrinking or eliminating the pockets around the teeth that are the site of infection, without having to have gum surgery.